The blog post below addresses the astonishing lack of discernment among self-professed Christians when it comes to contemporary Christian music (CCM). The truth of the matter is that most CCM really isn’t Christian at all — not even close! How do I know that? By listening to the lyrics. More often than not CCM is unbiblical, even blasphemous! But many Christians don’t have the spiritual discernment to pick up on it. Sadly, some people who profess Christ really don’t care about the words that go from their lips to God’s ears. Why? Mainly because worship is all about me, not about God, so little or no attention is paid to the words we sing to Him. But words matter, and what we say to God should matter a lot. Instead, Christians are focusing on themselves — their feelings and experiences….have I hit a nerve? So now to Learning the Path’s post. Some of the videos are disturbing to watch. I urge you to watch them anyway. Think of this scenario. A pastor is reading Alistair Begg’s book, “Preaching for God’s Glory”. He sees a point that he would really like to make the next Sunday. When he’s done reading, he picks up Brian Houston’s “You Need More Money” from the heresy shelf, in which the same point is made (This is a hypothetical). He gets up in the pulpit, and instead of using quotes from “Preaching for God’s Glory”, he uses the quotes from “You Need More Money”. What is wrong with this? 1. This gives credence to Brian Houston. It will likely cause his undiscerning congregation to listen to Brian Houston, quote Brian Houston, read Brian Houston, and even recommend Brian Houston to others. 2. Brian Houston’s writings reflect his theology. What he said will be said leaning towards the point he wanted to make, using the same hermeneutic (Way of reading the Bible) he usually uses, and showing the same errors common in his theology. Now, can we agree that a Church-goer’s theology is usually relatively similar to that of the pastor? So let’s look at the congregants at Hillsong Australia (Brian Houston) and Parkside Church of Cleveland (Alistair Begg). In this case, Hillsong Music and the Gettys (Who are former members of Parkside). Let’s say someone is given an option of who to sing in Church. They can choose between Hillsong’s “Jesus, Lover of My Soul” and Keith and Krystin Getty’s “In Christ Alone”. What if that person were to go with the Hillsong song? Would it be just as wrong as quoting Brian Houston above Alistair Begg? I would say yes. The same two points still stand. Hillsong’s music still reflects their theology, and it is still endorsing a group that preaches the Word of Faith heresy and false Prosperity Gospel. It would be as if you had Brian Houston come in and write your worship music for you. What’s sad is that some of the most popular music groups out there have some of the most terrible theologies. 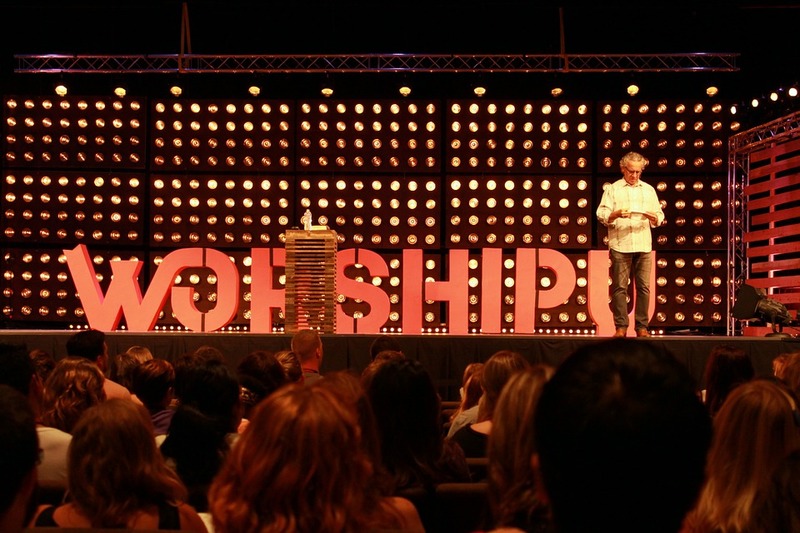 Hillsong promotes Word of Faith heresy. Jesus Culture happens to be under Bill Johnson, a Hyper-Charismatic who denies Sola Scriptura (Scripture Alone) and stated that Jesus ceased to be God on the cross. This comes out not only in their music, but at their concerts (I will discuss this further later on). Jars of Clay’s singer and songwriter, Dan Haseltine, said, “I just don’t see a negative effect to allowing gay marriage. No societal breakdown, no war on traditional marriage. ?? Anyone?”. Amy Grant isn’t much better, as she has knowingly preformed alongside Lesbians and has known about her Gay Fanbase since she was 18 without calling any of them to repentance. Matt Maher is a devout Roman Catholic who has preformed for Pope Francis. Do we really trust these people to write our worship music? To write the songs we sing when worshiping a Holy God? These people wrote these songs to idols, so why would we repeat them? Continue reading — more videos.